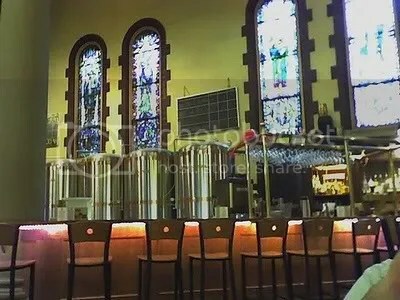 Nestled in the working class borough of Lawrenceville, Pennsylvania, Church Brew Works is a must for beer lovers and foodies visiting Pittsburgh. Built in 1902 as a Baptist church, the building now pays homage to barley and hops. The brewery/church is adjacent to a football field. Ironically appropriate for a city where beer and football are a religion and names like Franco Harris and Lynn Swan are mentioned with the reverie reserved for deities. 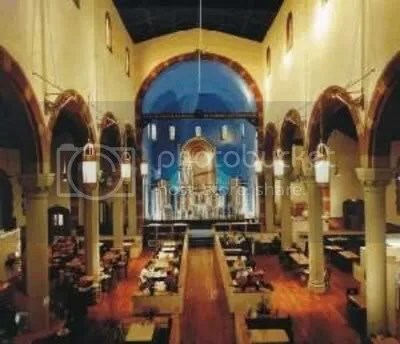 The building is incredibly maintained, and when walking in through the giant church doors, my eyes immediately scanned over the rich wood floors, down the center isle, to the alter. There, glimmering in the light cast by the original stained glass windows, right where some Irish-American preacher used to give Sunday sermons, are the giant vats full of the restaurant’s unique brews. Since we had a short wait for a table, we decided to go ahead and order the 8 beer sampler which permits you to taste a collection of permanent and seasonal beers brewed right there on sight. With names like Celestial Gold, Burly Friar Barley, and Blast Furnace Stout, the beers play on the unique heritage of the building and the city itself. The rich flavors and variety of the beers stand up to their creative names. My personal favorite was Pious Monk Dunkel, a dark sweet brew, almost like the Belgian beer Leffe. When we sat down and perused the menu, it was the first time in some while that I had looked at a menu and honestly been overwhelmed with appealing choices. Everyone I was with also had a hard time deciding so we settled for a bit of everything to split amongst ourselves. For the first course I enjoyed an Israeli Couscous salad with shrimp and pine nut crusted goat cheese. Damn. What a light and delicious dish. I have to admit I am quite partial to chevre and it went perfectly with the lightly seasoned couscous and fresh shrimp and spinach. My companions got the smoked spinach and Gouda cheese dip and the featured seafood bisque. The bisque was creamy and delicious, but the cheese dip was a clear crowd favorite. We all concurred that this was the most pleasurable visit we had ever had to a church as we washed the delicious dip down with Pious Monk Dunkel. After such an incredible start to the meal I couldn’t wait to see our server emerge from the confession box turned servers’ stand with our entrees. We indulged ourselves with a filet, exotic mushroom ravioli, fafella shrimp pasta, and a Pittsburgh tradition: perogis. Perogis are analogous to giant ravioli, stuffed with potatoes or meat, and sometimes in a tomato sauce or just a butter sauce. While they aren’t anything extraordinarily exciting or adventurous, they are rather particular to Pittsburgh and pretty tasty. In fact, everything we ate was wonderful. However, the exotic mushroom ravioli, stuffed with four types of mushrooms, covered in a rich tomato sauce and melted parmesan cheese, was by far the star. This dish was incredible, and although the beers are obviously the featured drinks, Church Brew Works has a decent wine selection which allows you to pair a bold Argentinean or sun kissed Spanish wine with your entrée. That’s a beautiful church. Looks a lot like mine.